This page is about the area. For other uses, see South Gloucestershire (disambiguation). 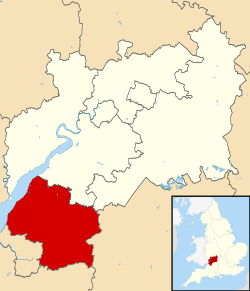 South Gloucestershire is a unitary authority in South West England. It comprises multiple suburban areas to the north and east of Bristol. South Gloucestershire was created in 1996 from the northern section of the county of Avon, which was abolished at that time. In 1996, the county of Avon was abolished, and South Gloucestershire was created as a unitary authority comprising the former districts of Kingswood and Northavon. The area borders the city and county of Bristol, the Bath and North East Somerset unitary authority, plus the shire county of Gloucestershire. The River Severn forms the north-western edge of the area, with a wide coastal plain terminated by an escarpment. East of this is the wide River Frome Valley drainage area. Further east is another escarpment running roughly north-south, passing between Yate and Chipping Sodbury and west of Pucklechurch. The Cotswolds Escarpment forms the eastern edge of South Gloucestershire. A small part of the Cotswolds and the National Trust site of Dyrham Park are also in the district. 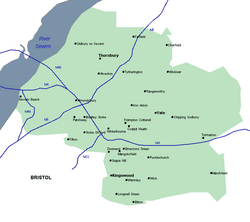 South of the motorways are suburbs of Bristol while areas north are rural areas. Some of the inner green belt has been taken away by developments like the new town of Bradley Stoke. Currently South Gloucestershire is working with the City and County of Bristol in developing a large MetroBus system. The area also has an important and very well used railway network, with many direct routes to towns and cities across the UK. This includes eastward to London and westward through the Severn Tunnel to Cardiff and the rest of South Wales. There are also routes down to the South-West counties and north to England's second city, Birmingham. Many routes cross in Stoke Gifford at the Bristol Parkway railway station. Filton Airfield (With museums for Concorde & the Bristol Aero Collection due). South Gloucestershire Facts for Kids. Kiddle Encyclopedia.